And here we find ourselves. Right smack in the middle of the January blahs. Interestingly enough, I am enjoying this winter more than I have winters past. Is it just me, or is there is something totally relaxing about winter. I can put my pjs on when I get home from work at 4:00, hibernate in the basement, drink hot chocolate, soak in sudsy baths, and never leave the house again until I have to go to work in the morning. I can read blogs all night without feeling lazy, I can go to bed as early as I feel like because it's just too cold to go out! Gone is the desire to go out anywhere. All I want to do is cuddle on the couch and relax. And you know what? According to winter, that is totally okay! Also, I love January because The Bachelor starts again. I will admit, though, I've been a little peeved at Bachelor ever since Emily and Jef broke up. I have absolutely no faith in the system and look at it now as nothing more than entertainment. But... great entertainment it is! And so it is with excitement and glee that I will hibernate in my basement tomorrow night and enjoy two guiltless hours of The Bachelor. Care to join me? Today I'm stoked to introduce you to Stephanie from Bourbon and Glitter. I've got to say, this girls makes my New Years resolutions look like mere child play. I came up with 15 goals and thought I was totally tackling the world. Stephanie has got 101 goals for 1001 days. ONE HUNDRED GOALS. Talk about motivated. This girl almost makes me want to get out of my winter hibernation and start more of my own goals. Well readers, it's guest post time, and I'm pretty excited to be here on Life of Bon today. Obviously for the reason that Bonnie is awesome and hopefully guest posting on her blog will make her like me and then I'd feel like one of the cool kids, but also because "write a guest post" can now officially be checked off my list of 101 in 1001. It's a list of 101 things I'd like to accomplish in 1001 days. I really love checking things off that list. Or any list really. Either way, my name is Steph and I blog over at Bourbon and Glitter. Since this is my first time at Life of Bon, I wanted to do an introduction to me. Now, I wish I could give you a quick description to sum up everything you'd find on my blog, but I just can't. It's everything from making goals to making cocktail cupcakes to making 1000 jello shots. In my blog, as in my life, I never take anything too seriously. I like to think that sometimes you'll learn things, find some recipes you like, get some ideas for bar crawls and costumes (two of my very favorite things) but mostly you'll just see a lot of photos of my fur baby, Hawkeye. After the Iowa mascot, not the comic book. But I make no apologies for that, because she's just the darn cutest dog ever. Sure there's an occasional serious post but I want you visiting my blog for the same reason I like to write it - pure fluffy entertainment with a hint of humor just to make you smile. I like to amuse people. I guess I feel like, after a lot of ups and downs, my life is heading pretty consistently in a positive direction, and I want to document that. Like any blogger, checking my blog stats is fun.The best part about that is it shows me that most of the visits to my little space are repeat viewers. That's pretty awesome if you ask me- my readers like to stick around? Lucky me! So maybe, just maybe, you've read enough to come on over and see if you might like to stick around too. So thanks very much for having me Bonnie! And you awesome Life of Bon readers, I hope you'll stop by soon! I definitely wish I could join you for some Bachelor watching! My husband seriously makes fun of every little thing on the show, so I can't really hear most of what goes on. He gets mad if I go watch it in the other room though! Watching it with some ladies would seriously be fun! I totally agree on the Emily & Jef breakup..Very sad.. but great entertainment!! As soon as I put the kids to bed I crawl into my pj's too and if I'm really lucky there will be a bottle of wine or a cocktail waiting for me lol. Ummmm we should definitely watch the Bachelor together. K thanks bye. i am so freaking glad you reminded me of the bachelor coming on tomorrow! i am officially not dreading tomorrow anymore! 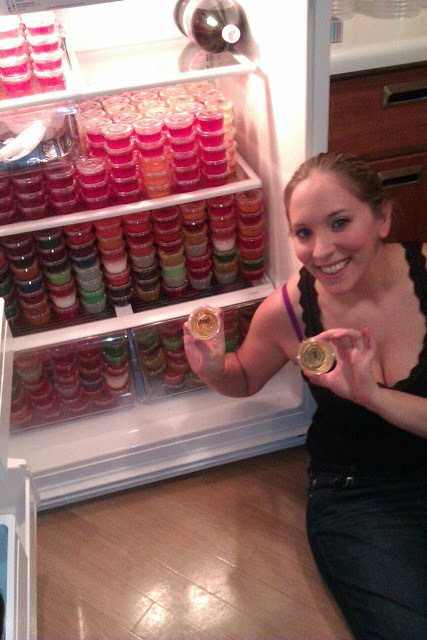 WOW, I can not imagine 1,000 jello shots, that is a TON! I'm still not over Jef and Emily. COME ON GIRL! HE WAS AMAZING! I will be watching it with you!! There is a girl who I work with and her best friend is on the Bachelor this season, and she made it to the top 3. I really just want to see the cat fights again. That is really why we all watch it.